On March 1, St. Luke’s Episcopal School hosted its first annual Leadership Breakfast, an event instituted to give students the knowledge and inspiration to plan, start up, and operate their own businesses. At the event, which was held in St. Luke’s Parish Hall before the start of school, fourth to eighth grade students were invited to sit down for breakfast and hear from a panel of successful entrepreneurs from the local business community. This forum led up to the SLES Trade Fair where students create their own businesses. 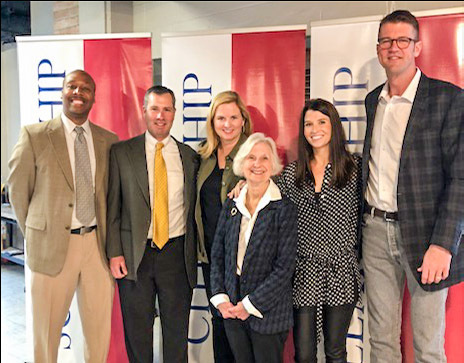 St. Luke’s Episcopal School opened its doors to four local businessmen and businesswomen at its Leadership Breakfast event this past March. The lineup of panelists, all parents of current and former students, included Susanna Frankland, owner of Olmos Park boutique Meadow; Lisa Nichols, founder of Nic Abbey Luxury Homes; Dr. Eric Miller, founder of Central Texas Pain Center; and Clint Poulter, founder of Clint’s Texas Salsa. In addition, Ben Hart, owner of The Factory of Champions, served as moderator for the event. During the forum, the panel described their experiences of creating businesses and shepherding them into success. Students were given the opportunity to ask questions, which ranged widely from “what were some of the struggles you faced when starting your business?” to “what subject in school most helped you?” Their responses included not only the expected subjects such as math and marketing, but also art classes that emphasized creativity and physical education classes in which team building was essential. Describing her experiences as a student, Susanna Frankland said, “I was fortunate to have had supportive teachers who challenged me never to give up. They made a huge impression on me and helped me to find joy in creating and solving problems together with my friends.” Dr. Eric Miller recounted his early passion for playing Scrabble and the many lessons he learned from competing in Scrabble competitions from the time he was in elementary school. “Although I did not win my first competition, that loss motivated me to prepare, practice, and develop a strong and positive attitude toward my work. I continue to use these lessons in my business today to build strong teams where everyone is lifted to their full potential,” said Miller. The Leadership Breakfast occurred one week before St. Luke’s annual Trade Fair, where fourth through eighth grade students sell homemade products to members of the school community. Students spend the weeks leading up to Trade Fair developing business plans, creating products to sell, and advertising their business. Each business then donates 25 percent of its profits to charity. Trade Fair is a decades long tradition that SLES students look forward to each year.